Become a music therapist with a music therapy bachelor’s degree at SMWC in our on-campus program. Do you love music? Do you have a genuine interest in helping people empower themselves? If you answered “yes” to those questions, then our unique music therapy degree program may be for you. Hands-on learning is important here. Beginning as early as your second semester freshman year, you will be able to begin clinical experiences in the community with the supervision of the faculty. The small class sizes at SMWC mean you’ll receive continual support from your professors, all of whom have extensive clinical experience. Once you’ve successfully completed the academic and clinical requirements, you will be eligible to take the music therapy board examination administered by the Certification Board for Music Therapists. Passing the examination leads to the professional credential MT-BC (Music Therapist-Board Certified). Music therapy is a healthcare profession that uses music and musical experiences to maintain or improve a person’s functioning level and quality of life. This is a great career for people who think of themselves as creative musicians, abstract thinkers, supportive listeners, problem solvers, responsible communicators and energetic leaders. A music therapist is an allied health professional trained to use musical, clinical and personal skills to help meet a patient’s needs. Additionally, a music therapist uses many instruments and techniques to help patients in a variety of settings including schools, hospitals, nursing homes, rehabilitation centers and psychiatric facilities. 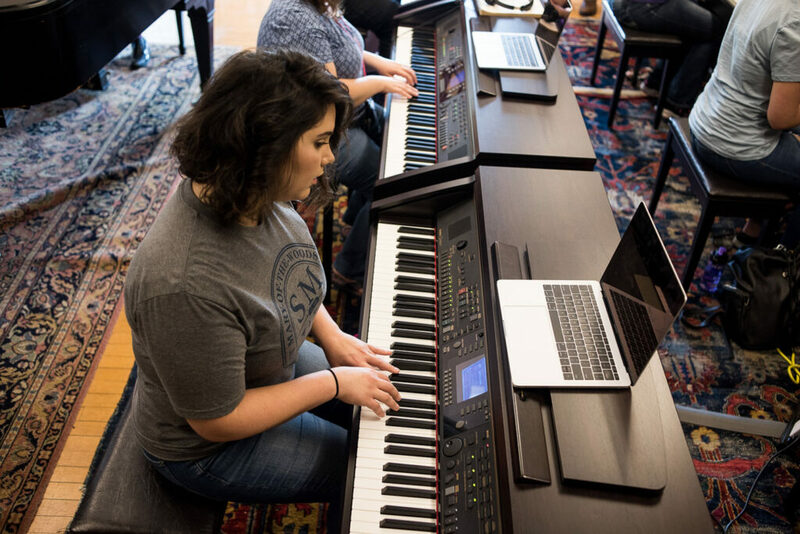 Rooted in liberal arts education, the bachelor’s degree in music therapy prepares you for a career enabling you to help others while surrounded by music you love. At SMWC, you don’t have to wait until graduation to start getting practical experience. During the second semester of your freshman year, you are able to begin practicum experiences in the community and receive weekly supervision with faculty. A bachelor’s degree from SMWC requires at least 120 credit hours. In addition to general education courses and the following course requirements, students must also complete 1,200 hours of clinical experience (approximately 200 hours in practicum experience and approximately 1,000 hours in internship). Auditions are required for prospective music therapy students. Music majors take 43-45 credits in core courses. Must complete three (3) additional credit hours of music electives. A course that develops concepts and skills in aural perception and music reading. A course for the development of concepts and skills in written music theory. Every year. Use of the computer and MIDI synthesizer keyboard to create, edit and perform music scores. Notation and sequencing software programs will be used. Spring, every year. Prerequisites: basic piano keyboard or consent of instructor. Study of non-Western and Western music from the ancient period to contemporary. Course presents music in relation to the social and cultural background of the periods. Every year. Prerequisite: MU 225 or consent of instructor. Music majors must study the primary applied instruments for credit each semester and must accrue at least 7-8 credits in that instrument for the degree. Music majors must participate in an ensemble for credit each semester and must accrue at least 7-8 credits in ensembles for the degree. 29 credit hours required; MU 243 and MU 352 fulfill 3 credit hours of Music Core Electives. Choose MU 011 of MU 029, based on primary applied instrument. Provide applied practice of clinical music therapy interventions and methods for use in medical, long-term care, educational and rehabilitation settings. Focus on the functional skills needed on: guitar, voice and piano, as well as non- symphonic instruments. Spring, every year. Course fee. Prerequisites: MU 282 and MU 342. Introduction to basic conducting patterns and techniques with practical experience in choral/vocal and instrumental music. Prerequisite: MU 115 or consent of instructor. An introduction to the history of music therapy and to the application of music in the therapeutic treatment of a variety of populations. Fall, every year. Course fee. Designed to help students understand the process of music therapy from referral to termination. Special emphasis given to assessment and evaluation. Also investigates the dynamics and processes of music therapy groups. Spring, every year. Course fee. Prerequisite: MU 282 and consent of instructor. Develop functional guitar and vocal skills, stylistic and genre-specific techniques and understanding of terminology essential for use in music therapy clinical and educational settings. This course is primarily applied and performance- based in nature. Fall, every year. Prerequisite: Music therapy major or consent of instructor. Development of therapeutic skills on voice, percussion, piano and guitar used in clinical improvisation. Normally reserved for upper-level music therapy students. A lab is required as part of this course. Fall, alternate years. Course fee. Prerequisite MU 283 and consent of instructor. Developing a fundamental understanding of terminology and cultural uses, as well as basic skill and technique with multicultural percussion (e.g. African hand drumming, Latin-based instruments, etc). Fundamental skill and performance on Western traditional percussion instruments (e.g. trap set, marimba, etc) will also be included. Prerequisite: Music major or consent of instructor. Music therapy methods and treatment goals/objectives for children and adults with varied developmental and intellectual disabilities in group homes, schools, day programs and other residential settings. Also includes the development of assessment, evidence-based treatment planning and music therapy clinical skills for the purpose of effective treatment. Fall, every year. Course fee. Prerequisite: MU 282. Music therapy methods and treatment goals/objectives for individuals in long-term care, medical, rehabilitation, mental health, hospice and residential settings. The development of assessment, evidence-based treatment planning and music therapy clinical skills for the purpose of effective treatment. Spring, every year. Course fee. Prerequisite :MU 282. This required course provides necessary preliminary music therapy internship preparation, as well as addresses professional role and ethical issues in music therapy. Spring, every year. Course fee. Prerequisite: MU 257 or consent of instructor. An investigation of topics such as: the influence of music on human behavior; physiological responses to music; neuromusical research; hearing and music perception; human musicality. Includes individual projects. Normally reserved for juniors and seniors. Requires instructor’s consent. Spring or Fall, every year. Course fee. The study of various types of music therapy research. Exploration of research types in the literature. Qualitative and quantitative methods are investigated. Includes development of an original research proposal. Normally reserved for juniors and seniors. Requires instructor’s consent. Spring or Fall, every year. Course fee. This required course provides more in-depth internship preparation, as well as addresses supervision, administration, employment options and reimbursement issues in music therapy. Fall, every year. Course fee. Prerequisite: MU 386 or consent of instructor. Supervised internship for music therapy students who have successfully completed at least 180 hours in pre-internship clinical training. Student must have passed all music proficiency exams prior to enrolling in this course. Admission to the internship requires consent of the Director of Music Therapy and a “C-” or better in all music therapy courses. The internship placement is based on the student’s clinical and personal needs. The student must: 1) accrue at least 900 hours in internship training, 2) accrue a total of at least 1200 hours in pre-internship and internship hours, and 3) demonstrate entry-level knowledge and skill in all AMTA Professional Competencies. No text. As needed. Course fee. Supervised music therapy clinical experience. Elective course for music therapy students who have taken MU 490 but have not accrued either sufficient clock hours or competency in all skill areas. Requires consent of the Director of Music Therapy. No text. As needed. Course fee. Repeatable for credit. First pre-internship clinical experience for music therapy majors. This course will provide students with opportunities to learn various skills in music therapy through observation of music therapy sessions at a clinical site. Students will work under the supervision of an MT-BC at each clinical site and will experience the therapeutic process through observation. Meets the American Music Therapy Association requirements for obtaining pre-internship clinical hours. Primarily develops observational skills. Students will receive small group supervision with faculty MT-BC. Fall, Winter, every year. Course fee. Pre-requisite: instructor consent. Level 3b pre-internship clinical experience for music therapy majors. This course will provide students with opportunities to learn various skills in music therapy through co-leading, and/or leading group or 1:1 music therapy sessions at a clinical site (typically 1:1). Students will work under the supervision of an MT-BC and will experience the therapeutic process from assessment through final evaluation of treatment. Students will receive 2:1 supervision with faculty MT-BC. Meets the American Music Therapy Association requirements for obtaining pre-internship clinical hours. Fall, Winter, every year. Course fee. Pre-req: MU 157 and/or instructor consent. Level 4a pre-internship clinical experience for music therapy majors. This course will provide students with opportunities to learn various skills in music therapy through observation, co-leading, and/or leading group or 1:1 music Level 4a pre-internship clinical experience for music therapy majors. This course will provide students with opportunities to learn various skills in music therapy through observation, co-leading, and/or leading group or 1:1 music therapy sessions at a clinical site (typically medical or psychiatric setting). Students will work under the supervision of an MT-BC and will experience the therapeutic process from observation through final evaluation of treatment. Students will receive 1:1 supervision with faculty MT-BC. Meets the American Music Therapy Association requirements for obtaining pre-internship clinical hours. Fall, Winter, every year. Course fee. Pre-req: MU 157 and/or instructor consent. Level 4b pre-internship clinical experience for music therapy majors. This course will provide students with opportunities to learn various skills in music therapy through co-leading, and/or leading 1:1 or group music therapy sessions at a clinical site (typically similar setting as a pending internship placement). Students will work under the supervision of an MT-BC and will experience the therapeutic process from observation through final evaluation of treatment. Students will receive 1:1 supervision with faculty MT-BC. Meets the American Music Therapy Association requirements for obtaining pre-internship clinical hours. Fall, Winter, every year. Course fee. Pre-req: MU 157 and/or instructor consent. 10 credit hours required; MA 253, PS 111, and BI 230 fulfill some Woods Core Requirements but others must still be met. Examines the form and functional relationships of all the major organ systems of the human body. Designed for music therapy majors and fulfills the general studies science requirement for them. Course is available to others, but does not meet their general studies science requirement. Two one-hour lectures and one two-hour lab per week. Course fee. Prerequisite: Appropriate score on mathematics placement exam or completion of MA 101. Students learn a variety of international dances and the cultural background of each dance in folk and square dance. Social dance includes learning the waltz, fox trot, jitterbug, rumba and cha cha. As needed. Music therapy majors must demonstrate music skills as outlined in the American Music Therapy Association Professional Competencies. 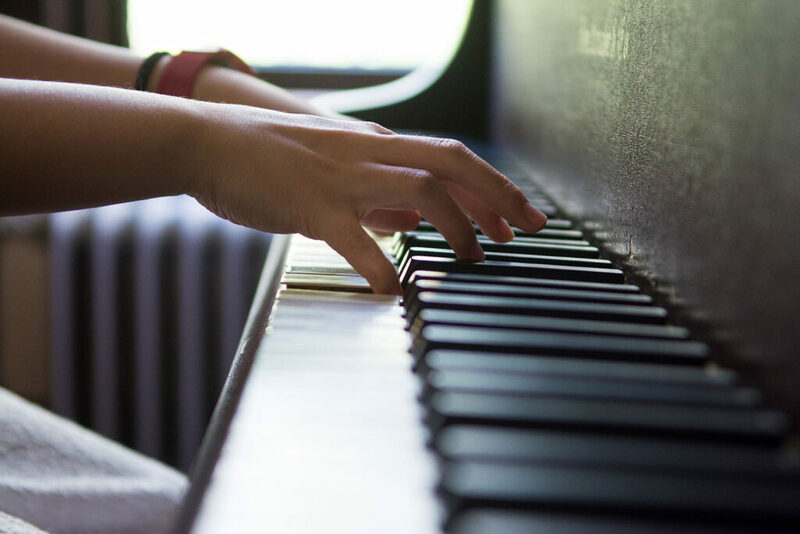 In addition, music therapy majors must pass the Piano Proficiency Examination Part I and Part II, the Guitar/Voice Competency Examination Part I and Part II, and Professional Characteristics and Dispositions Gateway Assessment before beginning internships. Students are responsible for scheduling the Guitar/Voice Competency Examination with the music therapy faculty on the specified Music Therapy Proficiency Days offered twice a semester. Each examination can be taken no more than three times. Additional details regarding proficiency and competency examinations are located in the Music Area and Music Therapy Student Handbooks. Who Does a Music Therapist Help?